There is money to be made in social media. But it’s not being made where you’d think — or at least where I thought. The bulk of the money is being made by companies and individuals selling services to other companies and individuals with the hopes of making money in social media. Confused? Me too. Thanks to social media, the days of the banner ads as revenue generators are behind us. Pricing was based on traditional print advertising, but used visitors rather than subscribers as the benchmark. Then when tracking became available, advertisers charged by viewership or “eyeballs”, And that morphed into click-throughs, and later into conversions. To be honest, I don’t think they were a good investment once the novelty wore off. Today, I am never quicker with a click then to shut those pop in ads for newsletter subscriptions et al. You still see banner ads (mostly on mobile) but online ads were replaced with search engine ads and corresponding landing pages. Those work but require an offer: either giving something away, a contest to win something or at least a discount — all at no cost. Companies now use social media for primarily publicity reasons to drum up interest in their product or service. To extend offers or up sell opportunities. They use it to aid in customer service. Making sales off your Twitter and Facebook? Didn’t think so. And if you are, I’m willing to bet it’s less than last year despite the fact that 2015 seems to be better for everyone. Simply put, the companies generating the most revenues through social media are the social media companies themselves. Facebook. Twitter. Pinterest. No surprise here. So are the companies aiding those companies. Social media posting, listening, monitoring software. The business of social media is selling social media. Still confused? You’re supposed to be, as that’s part of the plan. Right now the place where people I know are making money in social media is Instagram. How are a collection of selfies with my BFF and what-I-had-for-lunch snaps generating revenue? Uhm, well they’re not but I have friends who are doing well on a variety of topics from yoga to interior design. Early adopters to the medium, these friends have Instagram accounts that have amassed followers by the thousands (upwards of a million-plus in some cases). Their business plan? They’ll charge you to post your photo (not an ad, but photo mind you) on their account. All in the hopes that some of their followers will see it, and like it enough and follow you. So they can do the same to others. It’s the New World pyramid scheme – Ponzi minus the illegal part. There are companies that can tell you everything about the who what and where. What percentage of those million subscribers will actually check their Instagram doing the few hours you paid me to post your photo? Sssh! Don’t ask such details. You’re ruining the fun. 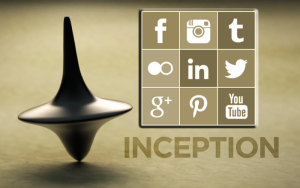 At times, social media reminds me of the plot to the movie Inception. You understand it (enough) to follow what’s going on (sort of), and are happy with the ending that makes sense (some what). Part of our confusion though is our own making. Social media hasn’t changed us; we’ve changed it.